Welcome, Everyone, to Mischievous Monday! Today you can Win our 20th Free Book in our $400, 31-Book Giveaway to Celebrate Who Chains You Publishing’s 2nd Anniversary. Today’s Prize? 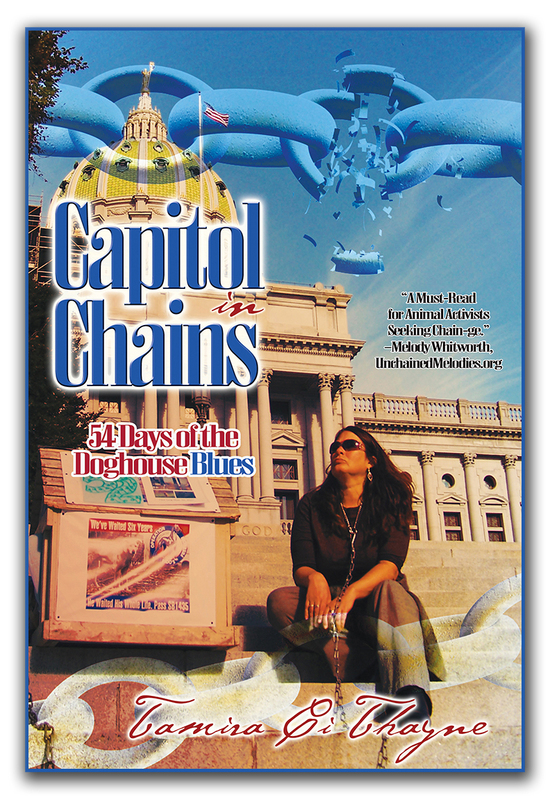 Capitol in Chains: 54 Days of the Doghouse Blues, by Tamira Thayne. How Can You Win It? Just click on our promo image (above), or this link, to bring you to our page, and let us know you want it in our comment section. The contest will run all day Aug. 20th, and we’ll select a random winner at 10:00 a.m. Eastern, August 21st. Spread the word and join in the fun! Capitol in Chains is available in paperback and kindle, and is a perfect fit for activist inspiration, and high school and college-level humane ed, too. In August 2010, one woman carried a doghouse to the steps of the Pennsylvania State Capitol building and chained herself to it, seeking passage of a law protecting dogs from life at the end of a chain. Not knowing if she’d be arrested, ignored, or ridiculed, she set aside her fears and acted on behalf of the voiceless: dogs—the most social of beings—whose needs have been overlooked by those with the power to create chain-ge for their future. This is her story, and the story of the 54 days she and others spent chained at the bottom of the Capitol steps in Harrisburg, Pennsylvania. May you be inspired, entertained, and educated about the needs of Man’s Best Friend, and how these needs continue to be negated in today’s society. 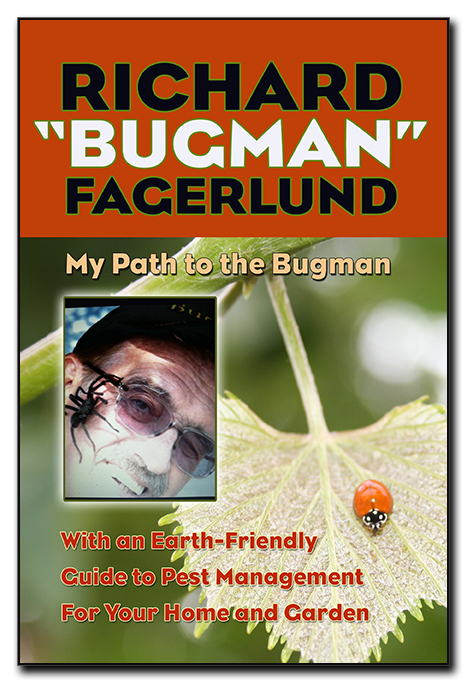 “While reading this book I thought many times that our commissioners, city councilman and state representatives all need a copy of this book. I’ve even thought about buying one for each of my city council and commissioners because they need to understand what really goes on with chained dogs. She is also the founder of Who Chains You Books, publishing titles for those who believe people—and animals—deserve to be free. 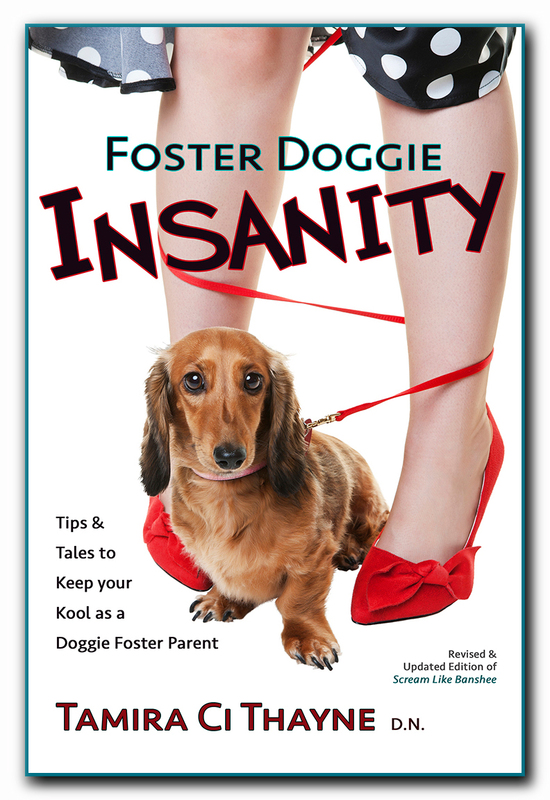 She is the author of Happy Dog Coloring Book, Capitol in Chains, Foster Doggie Insanity, The Wrath of Dog, The King’s Tether, The Knights Chain, The Curse of Cur (forthcoming), and the co-editor of Unchain My Heart and Rescue Smiles. 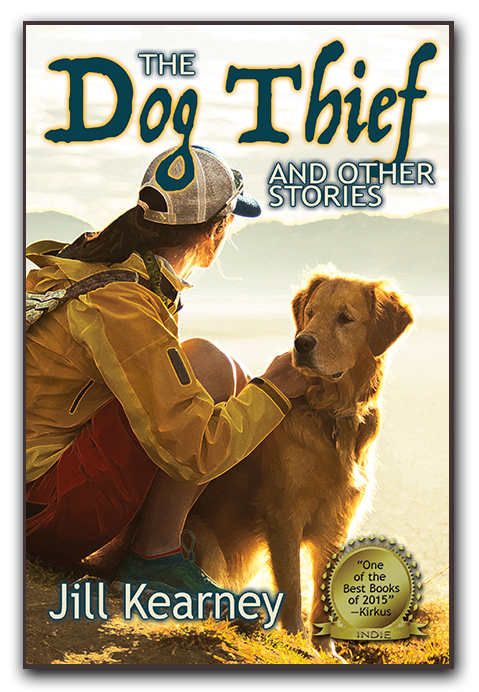 Free Book Friday: Win a Copy of “A Doggie Hero is Born”, Today ONLY! Welcome, Everyone, to Free Book Friday! Today you can Win our 17th Free Book in our $400, 31-Book Giveaway to Celebrate Who Chains You Publishing’s 2nd Anniversary. Today’s Prize? 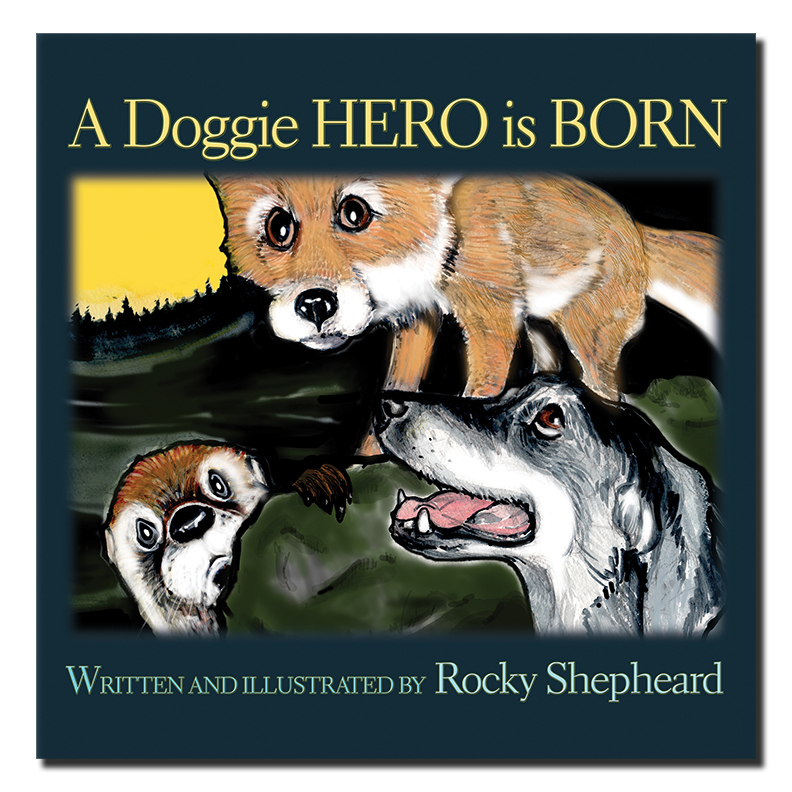 A Doggie Hero is Born, by Rocky Shepheard. How Can You Win It? Just click on our promo image (above), or this link, to bring you to our page, and let us know you want it in our comment section. The contest will run all day Aug. 17th, and we’ll select a random winner at 10:00 a.m. Eastern, August 18th. Romp through the wilds on a good old-fashioned adventure with pals Worthless, Sly Fox, and Otto. Worthless (as he’s called by his no-good captor) remains chained to his rickety old doghouse yet longs to be free and loved. His best friends step in and find a way to break his chains, and their quest for a new home takes off. Times get tough, but in the end will they win all the love they are searching for, and just maybe a new name for Worthless? 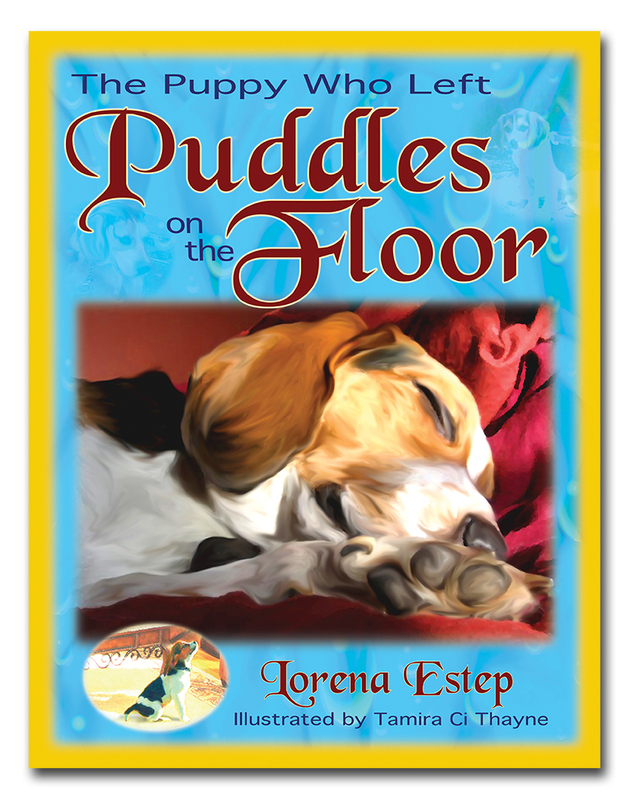 Written and illustrated by Rocky Shepheard, this Children’s Action/Adventure is full of both excitement and rich, magnificent illustrations to thrill your audience and teach a lesson in compassion and humane treatment of Man’s Best Friend. Perfect for all kids, young and old, this story is a wonderful way to educate children at home or in schools. 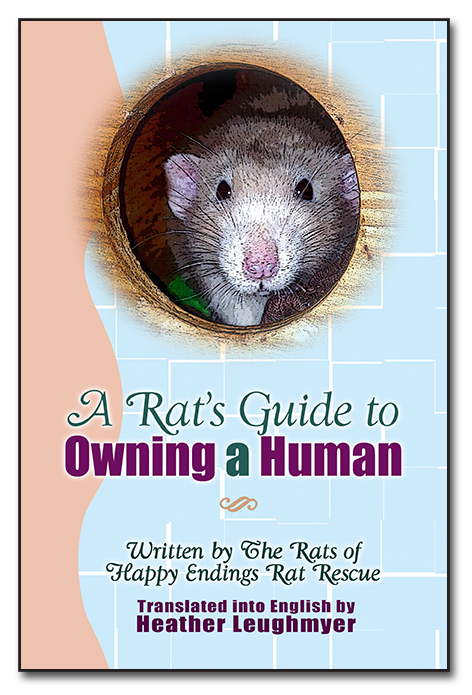 Who Chains You Publishing is proud to release books that are fun, educational, and are a voice for the animals. Rocky Shepheard is an artist, a vegan, and the creator of The Vegg. After learning about the treatment of chickens and the health risks of consuming too much dietary cholesterol, the Pennsylvania native adopted a plant-based diet. Not wanting to miss out on his favorite food, Rocky set to work on years of research to develop the perfect yolk substitute. Many say the flavor is even better than an egg! You can try The Vegg, an all-natural, cholesterol-and-cruelty-free product, and its ‘don’t miss’ sidekicks—The Vegg French Toast Mix and Baking Mix—by picking some up at www.thevegg.com. Win our 12th Free Book, Sunday ONLY! We’re on Day 12 of our $400 31-Book Giveaway to Celebrate Who Chains You Publishing’s 2nd Anniversary. Today’s Prize? Two copies of Happy Dog Coloring Book: From Chained to Cherished, by Tamira Thayne, illustrated by April Pedersen. How Do You Win It? Just click on our promo image (above) to bring you to our page, and let us know you want it in our comment section. The contest will run all day Aug. 12th, and we’ll select a random winner at 10:00 a.m. Eastern, August 13th. Spread the word and join in the fun! 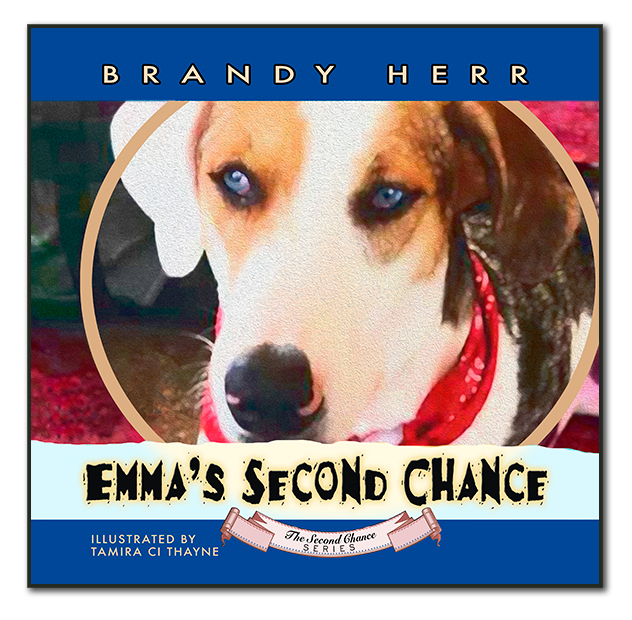 Happy Dog is available in a coloring book and story form on kindle, and is a great humane education choice for the classroom, too. 25 pages of whimsical black and white drawings from illustrator April Pedersen grace this wonderfully thought out and caring coloring book about a dog named Ranger, chained in the backyard and—like all dogs—wishing to be free. Ranger tells the kids about his hopes and dreams, and how he was ultimately saved from a life no dog should have to suffer. By the end of his tale, his fans will be smiling and proclaiming themselves to be Happy Dogs right along with him. Author and designer Tamira Thayne rescued and fostered over 250 dogs, giving them the happiness they deserved instead of life on a chain, during her time leading Dogs Deserve Better—a nonprofit who freed dogs from chains and pens. Now she is the founder of Who Chains You, publishing books for those who believe people—and animals—deserve to be free. She is the author of Capitol in Chains, Foster Doggie Insanity, The Wrath of Dog, The King’s Tether, The Knights Chain, The Curse of Cur, and the co-editor of Unchain My Heart and Rescue Smiles. April Pedersen is a freelance artist based in Reno, Nevada. She is partial to frogs, geocaching, science fiction, video poker, and chess. April is the illustrator of the Happy Dog! 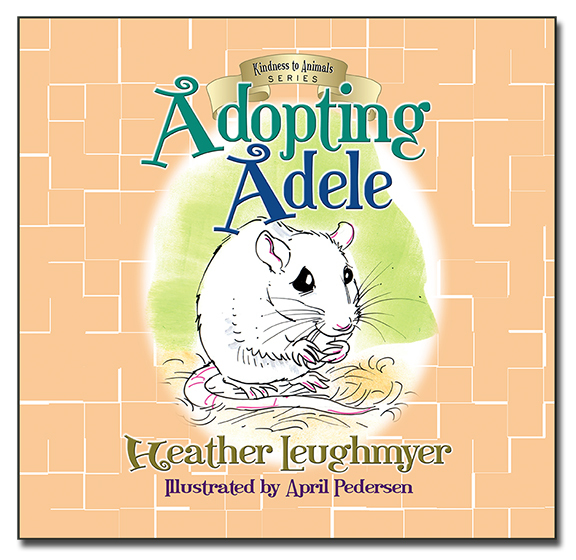 Coloring Book, Adopting Adele, Brave Benny, and Bravo’s Freedom. Win our 9th Free Book on this Thrifty Thursday! We’re on Day 9 of our 31-Book Giveaway to Celebrate Who Chains You Publishing’s 2nd Anniversary. Today’s Prize? It’s About a Dog, by Maggie Couch. How Do You Win It? Just click on our promo image (above), or this link, to bring you to our page, and let us know you want it in our comment section. The contest will run all day Aug. 9th, and we’ll select a random winner at 10:00 a.m. Eastern, August 10th. Spread the word and join in the fun! It’s About a Dog is available in paperback, kindle, and audiobook, and is great for humane education, too. Oliver the Owl isn’t used to caring about dogs. To Oliver’s way of thinking, dogs can’t be trusted. They eat birds, after all. But then a black dog—with some white spots—ends up living under the tree he calls home; Oliver discovers he can’t ignore, can’t forget, and can’t fly away from the plight of his fellow being. 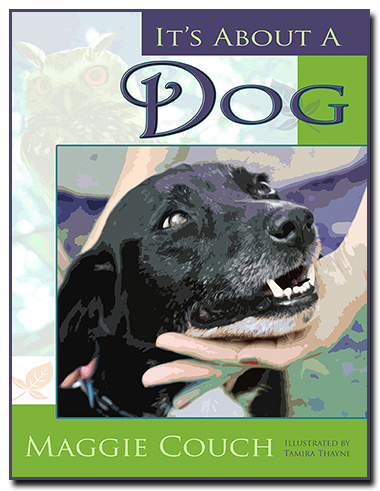 Will the neglected and chained black dog ever receive the happy ending Oliver believes he deserves? Oliver narrates the dog’s tale from a new and unique perspective; his viewpoint is sure to touch the hearts of all who read It’s About a Dog. Over the past 20 years, Maggie Couch has fostered more than 100 homeless dogs, in Connecticut and in Colorado. She has loved every one of them, and carries them in her heart always. An animal rights activist, Maggie has participated in demonstrations against circuses, zoos, dog racing, marine life “entertainment,” puppy mills and stores, cat declawing, dog tethering, and other horrific practices which hurt our trusting, loyal and loving friends. She hopes that someday very soon there will be no dogs in this world who wait for love in lonely desperation, as did the dog in this story. 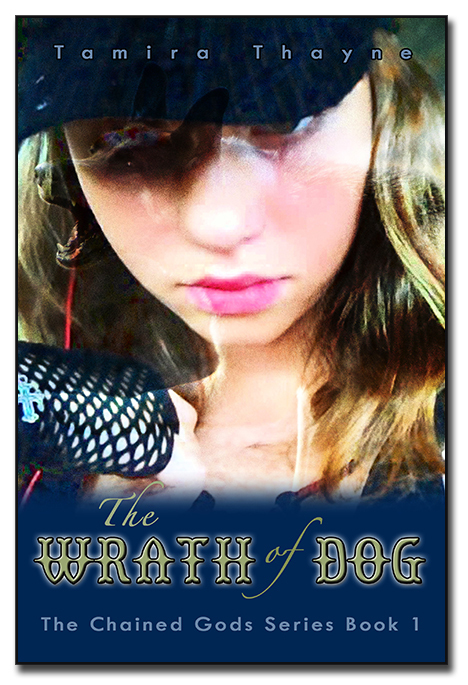 She hopes that, instead, all dogs will be cherished, protected, and loved, also as was the dog in the story. She lives in Colorado with her two elderly adopted dogs and a neighborhood stray cat who adopted them all and rules their happy home. It’s About a Dog is a perfect book for humane educators to use in the classroom to teach empathy for our animal friends. And, humane educators, nonprofits, and indie bookstores can all buy our books at wholesale costs! Learn more by clicking on the links above. It’s that time of year when students love to bring a beloved teacher an end of year gift. With budget crunches and classroom cuts, many teachers across the U.S. find themselves spending way too much out of pocket for books and other materials to educate the students. That’s why books always make a great teacher gift, and Who Chains You Publishing and our Crescent Renewal Imprint offer 26 books perfect for classroom reading, reaching students from pre-school through middle school. Pre-K teachers will love titles like Nana’s Banana, Happy Dog Coloring Book, What’s in the Corner, and Went Out to Get A Donut, Came Home with a Muffin. Grade school teachers could share all of the above PLUS so many more—with a plethora of books that advocate for the animals, the environment, anti-bullying, and education! 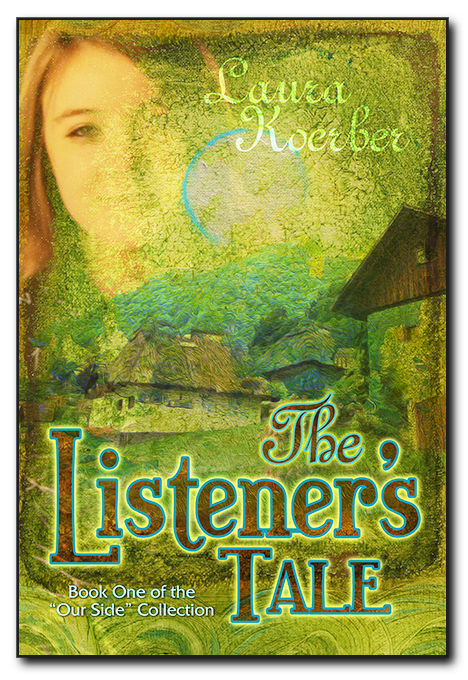 Middle school teachers can share many of the above, plus more, such as Rescue Smiles, The Listener’s Tale, and The Shapeshifter’s Tale. 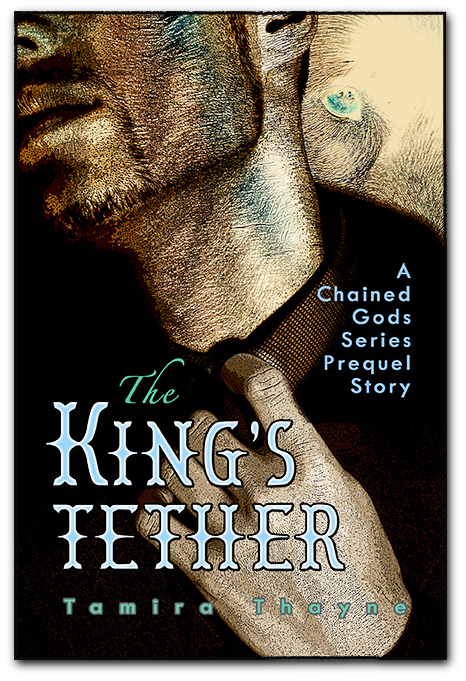 And finally, high school teachers will love the YA Paranormal offerings of The Chained Gods Series. 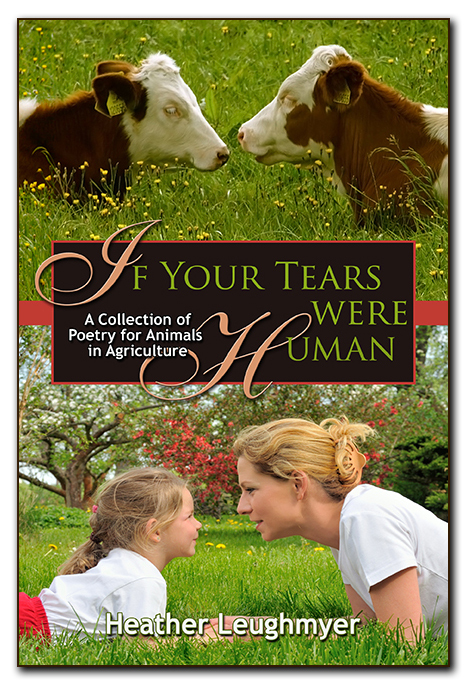 Know that your teacher’s an animal lover and an avid reader? 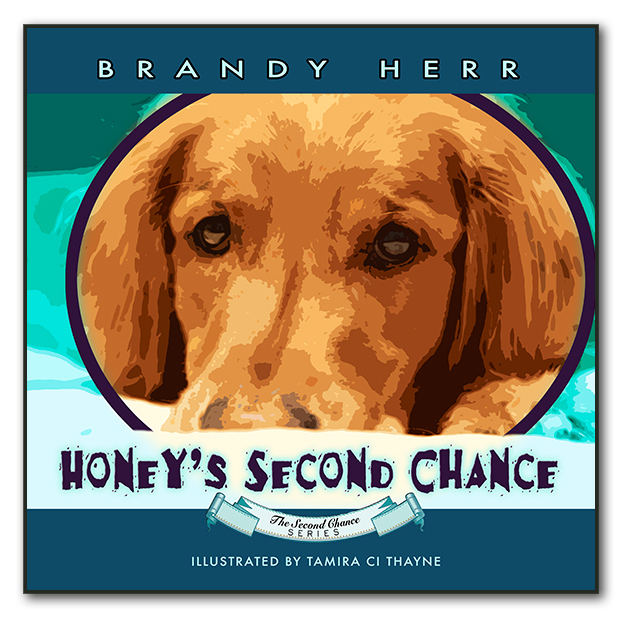 She/he would love one of our adult books in both fiction and non-fiction encompassing animals and society issues surrounding the care and treatment of animals. Who Chains You Publishing would like to thank the teachers for another great year of giving the gift of education to your students. We know the work can be heartbreaking, but the effort you put in is appreciated by so many. Thank you!